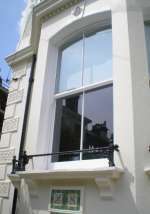 Using low emmissivity glass, an energy efficient warm edge spacer and filled with a gas ideal for compression, Slimlite Double glazed units offer something for everyone in the sash window industry. To the architect and householder it offers a real chance of retaining Georgian or Victorian proportions, while at the same time complying with building regulations and keeping us warm as toast. The low profile perimeter seal (5mm) and the width of the unit (11.3 mm) it can be puttied into conventional sized or existing wooden sashes, leaving no sign of the double glazing . The outer pane can also be heat treated to reproduce inconsistencies in the glass. This gives the characteristic Crown sheet look evident in many old buildings today. To the builder and joiner it offers savings in timber costs, installation, balancing and making good. The dark years are over, we now have a product we can recommend wholeheartedly.